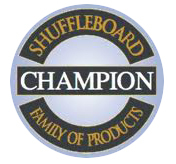 Champion is the #1 Shuffleboard Manufacturer in America and growing. Today you can find their tables worldwide and their International presence is expanding daily. Since 1988, Champion has been focused on the craft of building quality shuffleboard tables. They offer coin-operated and custom designed shuffleboard tables and games. They mix their own line of custom blended powders with seven speeds to choose from. Champion is located in Richland Hills,Texas and each table and playfield is built in-house to ensure Champion's high quality standards. Click brand name view all of the Champion Shuffleboard products. Contact your local dealer, Georgia Leisure for questions and pricing. Come by our store and check out these beautifully crafted tables.